Philips launches Dolby Atmos soundbar and new Flite range of headphones at CES 2016 | What Hi-Fi? Philips has followed in Yamaha and Samsung’s footsteps by releasing a Dolby Atmos soundbar. The company also has several new pairs of headphones launching this year. The Philips Fidelio Soundbar Speaker with Dolby Atmos (pictured above) is a mouthful of a name, but it’s the first Philips ‘bar to feature the 3D surround technology. Housing 18 drivers, including two up-firing drivers, to create an overall replication of a 5.1.2 configuration, a 220W wireless subwoofer with 8in down firing driver is also supplied to tackle low frequencies. Connections include two HDMI inputs, one HDMI ARC input, optical and coaxial digital and aptX Bluetooth for wireless streaming from compatible devices. The Philips Fidelio Dolby Atmos soundbar will be available from summer 2016. 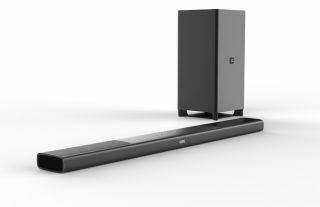 Philips also unveiled a second soundbar at CES 2016 in the shape of the Fidelio Compact Soundbar. As its name suggests, it takes up less space in front of the TV than other soundbars. Under the hood there’s four precision angled drivers and accompanying the ‘bar is a wireless subwoofer. Elsewhere on the Philips stand there was a new range of headphones called Flite, comprising three models: Aerolite, Everlite and Hyprlite. The Aerolite (pictured) and Everlite are over-ear models while the Hyprlite are in-ears. The over-ears feature 32mm speaker drivers, have a slimline design and have tilted ear cups with soft cushion pads for a “greater seal and enhanced sound isolation”. Meanwhile, the Hyprlite headphones feature 12.2mm drivers that produce “clear, crisp sound”, and also benefit from bass tubes in the earpieces to increase air ventilation. UK pricing has yet to be announced, but the over-ear models will be available in North America from April 2016, while the Hyprlite will be available from June. Other new headphone models include the HX1 in-ear and HX5 over-ear headphones, which feature LEDs built into the ear cups and pulsate with the beat of the music being listened to. Philips’ ActionFit range of sports headphones has two new additional models in the form of the RunFree Bluetooth in-ears and WirelessFreedom in-ears. Both models are sweat-resistant, with the WirelessFreedom being waterproof too, and come in three wearing styles: ear hook, fin or earbud. Finally, Philips also launched a new wireless speaker, the BT6600. It delivers 360-degree sound and can be used indoors or out.